As a manager you will be expected to lead the organization and have a strategic view. What is less obvious is the importance of details and knowing the balance between detail orientation and being strategic. To appreciate a wine you don’t have to know how it is made, like wise to appreciate your staff you don’t need to know the exact detail of everything they do. Providing Clarity of Goals and making all understand how their role fits in the overall picture is important to ensure efficient and effective execution of the key activities, also it helps to create the environment people need to be able to motivate themselves and feel good about their involvement in your department or project. To ensure you can provide that Goal Clarity you will need to have some basic understanding of the details of your operation. Striking this balance is a difficult part of your management position. If you are too involved in the detail you will lack the time and oversight to lead the organization and won’t be able to look beyond current issues and obstacles. If you stay on the strategic level too much, your staff will not appreciate where you want to lead them as they will see you as someone who does not really know what is going on at the other levels of the organization. The man below says, “Yes, You are in a hot air balloon, hovering approximately 30 feet above this field. You are between 40 and 42 degrees N. Latitude, and between 58 and 60 degrees W. longitude”. 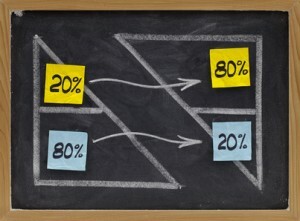 No doubt you will have heard about the 80-20 rule. 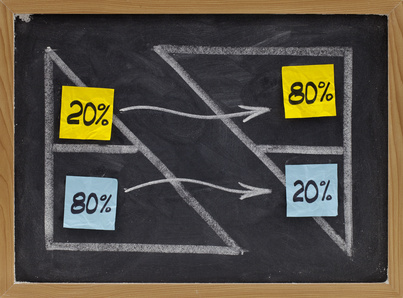 The rule comes in various forms but in this case it would suggest that spending 20% of your time on details should give you enough knowledge about 80% of the operational activities to ensure you know what goes on in your department or company. Conventional wisdom is that people are either strategic or detail oriented. In my experience, the most successful CEO I ever knew was both and lead the organization with an inspiring strategic vision yet knew enough detail to keep all his reports focused on great execution.